Hunt In: Sterling County & The Diamond C! I never bought from them but they have a good variety that I like. No. Engraved bolsters. Fancy wood or bone handle. Even a nicer handle besides those is fine. Something like this with a different message? Look at an old colt or smith revolver. Real nice hand engraving. That’s what I’m looking for. On the bolsters. Not the handle. This site has some that was special ordered by Deadwood. Check Shepard Hills Cutlery website they have some nice factory stuff and even some semi custom stuff. You talkin about post 365 style er na? I found that online when I was looking for one. You can see the website in the pic. A local lady does knives like this if it's something you are looking for. Can put pretty much anything on there thatll fit. Pretty reasonable on price too. I actually grew up with the Pardue guy out of midland. I forgot. Jackpot!! Just curious, why a trapper and those tiny bolsters to engrave. Not much to work with. This company will sell you the knife and engrave it. It’s what I want. I have a bunch of nice bigger knives. Griff custom metals does good work. Another Vote for Scot Sommerlatte in Brenham. 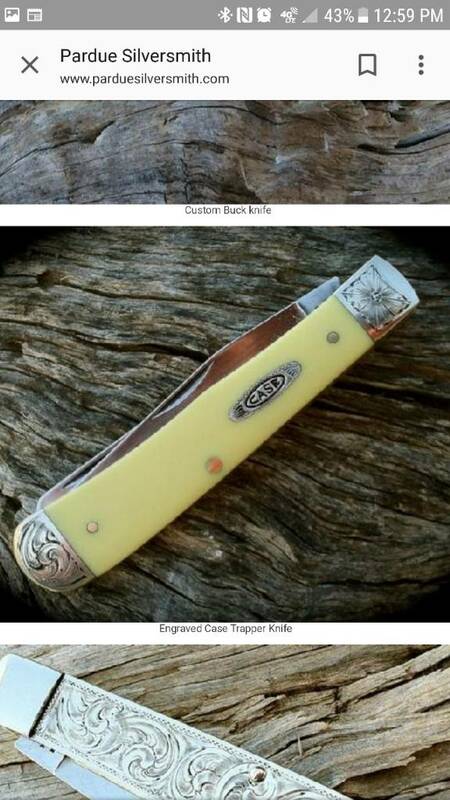 I found 462 of the engraved case knives on E BAY....there were some trappers included. Read what I typed about. Those are machine engraved. Or personalized. I want hand engraved. Real engraving. Not some junk done by a machine. Just FYI, Hooten's Hardware in Emory, TX has, I believe, the largest Case Knife Selection in Texas. My neighbor can do it.